When theres no more room in Hell, the dead walk the Earth.The One:12 Collective Dawn of the Dead Boxed Set includes two of the most recognizable undead corpses in cinematic history: Flyboy and Plaid Shirt Zombie.Flyboy Zombie, also known as Stephen Andrews, is cornered by the living dead while trying to escape through an elevator shaft. Now joining the forces of the infected, Flyboy is outfitted in blood stained clothing  a button down workmens shirt, belt, workmens pants, and wedge work boots. He comes equipped with his signature pistol from the iconic scene in the film.Straight from the original Dawn of the Dead movie poster, Plaid Shirt Zombie is presented in a distressed flannel shirt exposing his rotting flesh, jeans, and work boots.Both zombies clawed their way into the public consciousness from their appearance in George A. Romero's groundbreaking horror film, Dawn of the Dead, where a group takes refuge to make humanitys last stand against a horde of zombies swarming the U.S. Although their actual screen time was fleeting, their influence on pop culture is long-lasting. 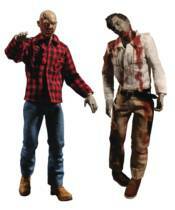 Life-size figures of the two characters flanked the entrance to the Monroeville Zombies Museum in the Monroeville Mall, the primary shooting location of the film.THE ONE:12 COLLECTIVE DAWN OF THE DEAD FIGURES FEATURES:One:12 Collective body with over 28 points of articulationOne (1) head portraitHand painted authentic detailingApproximately 17cm tallFlyboy Zombie ~16.6cmPlaid Shirt Zombie ~16.7cmTwo (2) interchangeable handsOne (1) set of posing hands (L&R)COSTUME:Flyboy ZombieButton down workmens shirtBeltWorkmens pantsWedge work bootsPlaid Shirt ZombieFlannel shirtJeansWork bootsACCESSORIES:Flyboy ZombieOne (1) pistolOne (1) One:12 Collective display base with logoOne (1) One:12 Collective adjustable display postPlaid Shirt ZombieOne (1) One:12 Collective display base with logoOne (1) One:12 Collective adjustable display postEach One:12 Collective Dawn of the Dead Boxed Set is packaged in a collector friendly box, designed with collectors in mind.